Atlas and Pan emerge from the far side of Saturn. Light passing through the upper reaches of the planet's atmosphere is refracted, or bent, distorting the image of the rings beyond. Pan (26 kilometers, or 16 miles across) is seen within the Encke Gap. Atlas (32 kilometers, or 20 miles across) orbits just beyond the outer edge of Saturn's A ring. This view looks toward the unilluminated side of the rings from about 12 degrees above the ringplane. 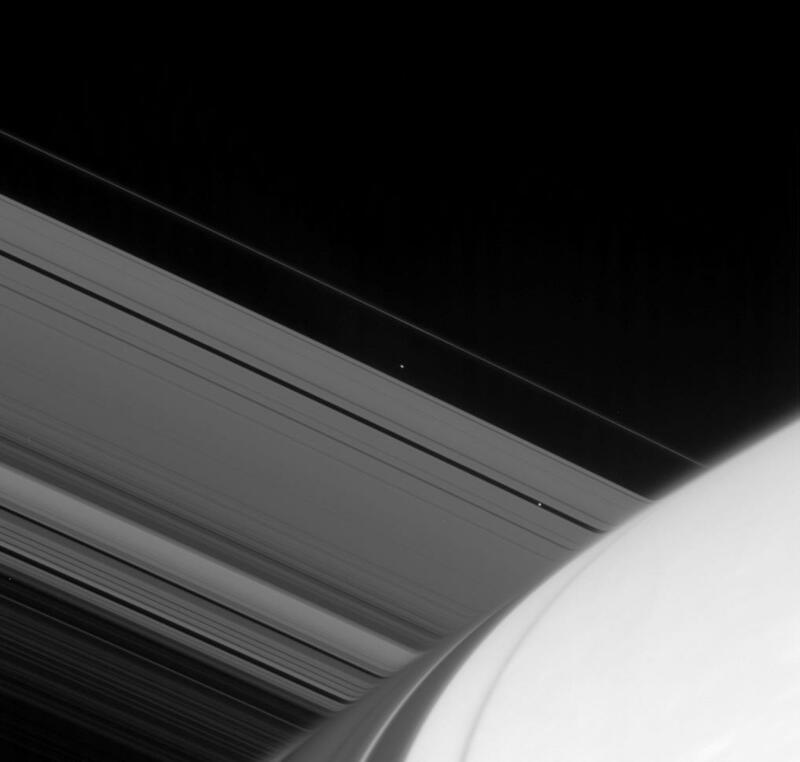 Shadows cast by the rings arc across the planet toward the Cassini spacecraft. The image was taken in visible light with the Cassini spacecraft narrow-angle camera on April 12, 2007 at a distance of approximately 1.6 million kilometers (1 million miles) from Saturn. Image scale is 10 kilometers (6 miles) per pixel.